Each spring, the Masters Golf Tournament at Augusta National draws millions of TV viewers. The unique tournament usually provides challenging competition and athletic drama. The Masters is even more special for those lucky enough to be able to attend the event in person and has been sold out for years. (See more info on this below) Here are some interesting facts about Augusta National that they may not tell you on TV. Info below shortened and taken from an online article, link included at the bottom of this list. Green Jacket- The Green Jacket came about for a very simple reason. In the tournament’s early years Augusta National members were encouraged to wear the jacket so patrons would know who to ask questions. Secondarily, when a member hosts guests in the clubhouse, the green jacket designates who gets the bill. Of course, the stories are legend about how long it takes to get a Masters pass—years. Families will them down to generation after generation. Each year the badge has a unique design and artwork. Here is a link which has images of all past Masters Tournament Badges. Patrons (spectators) enjoy the Masters! Polite fans- They are not fans. They are not a crowd or even a gallery. They are patrons. You’ll hear it often during the CBS broadcast. Also, while on the grounds, patrons are told not to run. Walking only. The Masters menu, low prices! 1980 prices for food and beer: It used to be pimento cheese sandwiches, but now there’s bbq, chicken and others—each for about $3. A beer costs under $3. Grounds crew keeps the course perfect! Small field of golfers, large maintenance crew- It’s the smallest major field—only 99 competitors compared to the 156 in the other three majors. Following the second round, the low 44 scores, plus ties and any golfer within 10 strokes of the lead advance to play the on the weekend. (making the cut) That means for Saturday and Sunday the field will be anywhere from 44 to 55. Get there early enough you will find more than 60 people working on the course, mowing, raking, edging, etc. Cheap golf- It’s one of the best-kept numbers in sports—the initiation fee to Augusta National. With barons like Warren Buffett and Bill Gates, among others, as members it goes without saying that money isn’t the object. And it isn’t. To join is reportedly under $100,000, which might be one-tenth of other high profile clubs in the country. And if you were lucky enough to play the course with a member, you can probably afford it. Guest fees are said to be about $40. Fine wine Augusta National is presumed to have one of the best private wine cellars in the world, buying the best French, Italian, American and Australian wines on futures. Those glasses of wine that tasted so good during dinner came from bottles that run $1,000 apiece, and more. 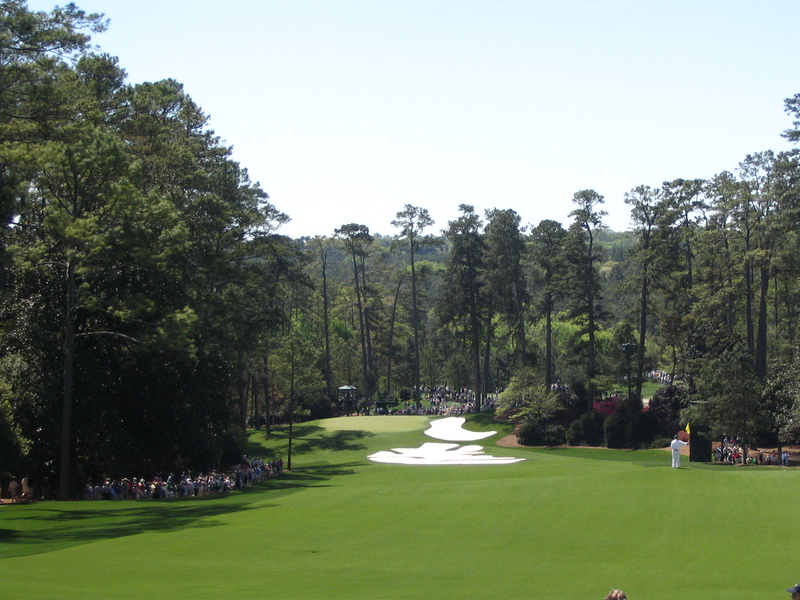 Waiting lists for badges: Beginning in 2012, Augusta National Golf Club announced it would begin making a small number of tournament tickets available for purchase through a random drawing following online registration, directly from Augusta National. Each year, a small number of tickets are returned to ANGC following the deaths of longtime ticket holders, or other reasons. Previously, those tickets were simply removed from circulation. But since 2012, fans can register online to take part in a random drawing for those tickets. To do so, golfers much register on the tickets page on Masters.com; registrants receive notification when the ticket application process is opened each year, shortly following each Masters tournament. The number of available tournament tickets is not listed, but rest assured the number is very small and your odds are very, very long. Link for Masters Ticket Info. Prior to those announcements, tickets to tournament days (rounds one through four) had not been available from the Masters Tournament directly to the general public since 1972. That year, Augusta National Golf Club opened a waiting list, but due to demand the waiting list itself had to be closed in 1978. (Practice-round tickets have been available) Twenty-two years later, in the year 2000, a new waiting list was opened. But it is now also closed. Augusta National Golf Club- located in Augusta, Georgia, is a famous golf club. Founded by Bobby Jones and Clifford Roberts on the site of a former indigo plantation, the course was designed by Jones and Alister MacKenzie and opened for play in January 1933. Since 1934, it has played host to the annual Masters Tournament, one of the four major championships in men’s professional golf, and the only major played each year at the same course. It was the number one ranked course in Golf Digest’s 2009 list of America’s 100 greatest courses and was the number ten ranked course on Golfweek Magazine’s 2011 list of best classic courses in the United States, in terms of course architecture. No running anywhere on the grounds. No sitting on the grass near the greens. No bare feet (even when sitting down). No chairs with arms. No folding chairs. No flags. No signs. No banners. No coolers. No strollers. No radios. No standing in officially designated sitting areas. No sitting in the standing areas. No cameras. No rigid chairs. No hats worn backward. No metal golf spikes. No outsize hats. No carts. And absolutely no lying down anywhere . No fanny packs larger than 10 inches wide, 10 inches high or 12 inches deep (in their natural state). No selling a Masters badge within 2,700 feet of an Augusta National gate. No walking through a driving gate. No Crowding- There is no crowding at the Masters because the club limits the number of entrance badges sold to keep the attending masses manageable. A four-day badge will go for as much as $5,600 on the secondary market, which means there is also no complaining. Badges are included in many wills. No membership applications- The club has no membership application process; if someone asks to join, the unified retort is, No chance. No Yelling- At the Country Club of No, because the atmosphere is reserved and austere, no one shouts “You da man!” after a golfer’s shot, another pleasant outcome. No weeds- there are no weeds at the Masters, to the naked eye, on the more than 350 acres that play host to the tournament. No large wildlife- There are squirrels and birds. But a high protective fence around the entire tract keeps out larger animals, spurned as unwanted interlopers. A few years ago, when a deer ran across the eighth green, spectators gasped and pointed, and the local newspaper ran a picture of the animal. People who have been coming to the Masters since the 1950s said they had never seen a deer on the course.